Thank you for taking the time to look at this website! I just want to tell you a little about how Children’s Helpers Worldwide was started. During my gap year, I was a volunteer at New Life International Orphanage in Ghana, West Africa. The founder of the orphanage is called Ruby Ayivorh. She is an inspirational woman who cares deeply for other people. I lived in her house, with her and her family, and taught in the orphanage school every day. After leaving, I could not bear the thought of not going back, and returned the following summer. I started to fundraise to help the orphanage in a practical way. While visiting China, I met another inspirational woman, called Gao Ya Li. 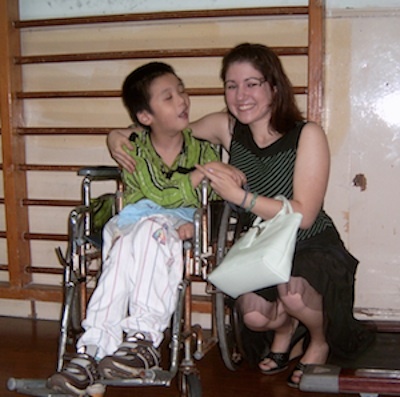 Her son has cerebral palsy and she established the Shanghai Bo Ai Rehabilitation Centre to help him and other children. I wanted to be able to help this centre too. I then decided to set up this charity, Children’s Helpers Worldwide, because I thought it would be an effective way to fundraise and help the children. I also believe that it is essential to work with local organisations as this will ensure that we provide the right help depending on the children’s needs, and will also allow development to be sustainable. We expanded, setting up projects in other countries and are now focusing on getting people involved with fundraising for the various projects. Please do send me an email if you yourself would like to fundraise. Being a small charity means we are able to work very closely with the organisations we support, and can then really see the differences that are being made. I want to thank everyone who has supported us so far, and would love to hear from anyone who would like to get involved with making a real difference to the lives of these children.